Mount Rainier National Park became the fifth national park in the United States in 1899 and still stands today as one of the most scenic and spectacular national parks in Washington State. 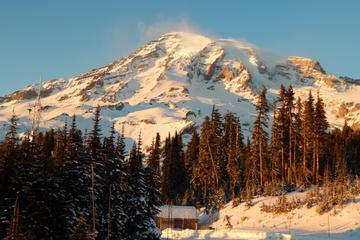 Much of that claim to fame comes from its impressive namesake peak, the 14,411-foot Mount Rainier. On every side of Rainier (and even on top), adventure awaits for those who want to explore this rugged and enchanting environment, and the best way to experience this national treasure is by trekking on one of the many different hiking trails found within the national park boundaries. Where you want to start is up to you, because any which way you head, you'll get a good taste of what makes the mighty Mount Rainier one of the most iconic peaks in the country. One of the most quintessential hiking trails in Washington State, the Skyline Trail circumnavigates the iconic Paradise area of Mount Rainier National Park and treats visitors and tourists from around the world to some of the best scenery in the Pacific Northwest. Easily accessible from the Henry M. Jackson Visitor Center and neighboring historic Paradise Inn, the Skyline Trail is a popular trail for all levels of hikers, particularly in the summer peak seasons (July & August), when a whole bouquet of wildflowers blossom throughout the mountain meadows. There is plenty of scenery to share on the 5.5-mile Skyline Trail, and whether you trek clockwise or counter along this well-marked loop, be prepared to stop a few times and admire the world that surrounds you. A close-up view of Mount Rainier and the Nisqually Glacier follow this hike the entire way, punctuated by luscious meadows, cascading creeks, and a chance to see marmots and other wildlife frolicking in the splendor. Near the midpoint of the Skyline Trail, Panorama Point treats hikers to big views of the neighboring Mount Saint Helens, Mount Adams, and Mount Hood on clear days. Put it all together, and it's easy to understand why this area of Mount Rainier National Park is called Paradise. Found on the northwest side of Mount Rainier, Spray Park extends from the Mowich Lake walk-in campground and treats visitors to a dense collection of Pacific Northwest attractions and scenery, including the 350-foot Spray Falls waterfall. Access to the trailhead requires driving down an unpaved Forest Service Road, and the terrain will test your fitness level, making Spray Park potentially less crowded than some of the other trails in the popular Mount Rainier National Park. There are two options to explore the Spray Park Trail, with the first being a seven-mile, out-and-back trek to Spray Falls, passing through a dense forest and a far-reaching viewpoint from Eagle Cliff. For more of a challenge, hikers can continue past Spray Falls, climb some hearty switchbacks, and make a 16-mile loop through Spray and Seattle Park, all the while gazing at iconic scenery like Carbon Glacier and Observation Rock before completing the loop. 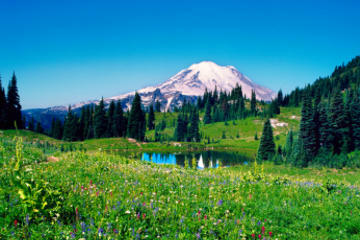 The Naches Peak Loop trail is a family-friendly, moderate loop on the southeast side of Mount Rainier National Park. This popular looped trail spends half of its time on the Pacific Crest Trail (PCT) and circumnavigates Naches Peak, providing stunning views of wildflower meadows and a beautiful backdrop of Mount Rainier the entire way. Beginning at the scenic Tipsoo Lake, the 3.5-mile Naches Peak Loop can be tackled by going either direction, with both ways providing big views of Dewey Lake at the trail's middle point. Hit this trail in late July or August for wildflowers, as well as an abundance of people, but with the enormity of the sights to see at this popular Mount Rainier hiking attraction, there is plenty for everyone to explore. A favorite route for climbers looking to ascend the mighty Mount Rainier, the Glacier Basin trail is also popular with day hikers, who come to see the splendid scenery on the park's northeast side. This area of Mount Rainier has a mining history before its status as a national park, and evidence of that era can be found underfoot as you follow along an old mining road and converted trail that leads the way into Glacier Basin. Along the trail, hikers are exposed to big views of Mount Rainier and the enormous Emmons Glacier, as well as meadows and forests carved out by the cascading White River, making for viewpoints and spectacular scenery every step of the way. The Glacier Basin Campgrounds, 3.5 miles into the trail, acts as a great turnaround point for an adventurous day, but before you head back to the trailhead, be sure to take a moment to relish Glacier Basin's incomparable beauty. The Tolmie Peak trails offers two main areas of attraction that are well worth its seven-mile round-trip. Beginning at Mowich Lake on the northwest side of Mount Rainier, the Tolmie Peak trail follows the around-the-mountain Wonderland Trail for two miles, before diverging off Ipsut Pass and following its own path to the shores of the stunning Eunice Lake. While the habitat and surrounding environment of this emerald lake is worth the journey itself, by following along the Tolmie Peak trail for another mile to the summit, where the Tolmie Peak fire lookout awaits, you can add an unforgettable view of Mount Rainier and the surrounding wilderness to your adventure. Departing from the Sunrise Visitors Center on the northeast side of Mount Rainier, the Mount Fremont Lookout trail takes hikers to the top of one of the last remaining fire lookouts in the park and rewards visitors with outstanding views of the craggy Cascade Mountains that define this area of the country. With the Sunrise Visitors Center already at an elevation of 6,300 feet, the hike up towards the fire lookout doesn't involve a relatively large amount of climbing, making this 5.6-mile round-trip a popular choice for every level of hiker. From the Sunrise Visitors Center, the route follows along the Sourdough Ridge trail for 1.5 miles and then connects with the Mount Fremont Lookout trail for the last 1.3 miles, exposing hikers to big views of Mount Rainier, the Cascade and Olympic Mountains, and if you catch them at the right time, an abundance of mountain goats that call this rugged environment home. Narada Falls is a popular photo opportunity at Mount Rainier National Park not only because the two tiers of this impressive waterfall cascade for more than 180 feet, but also because between these two tiers, the Mount Rainier Highway crosses over the falls. While it's worth the visit to just step out of the vehicle and admire the waterfall, the Narada Falls trail that extends past the gushing water is highly recommended for all skill levels. The Narada Falls trail is a less busy option to explore the Paradise area of Mount Rainier and offers great views of Reflection Lake and the Paradise River, as well as distant views of the Tatoosh Mountain Range, on a five-mile loop that begins and ends at the popular roadside attraction of Narada Falls. The Burroughs Mountain trail extends high above the flanks of the White River and Glacier Basin trail, providing a different exposure to the stunning northeast side of Mount Rainier National Park. Accessed from the Sunrise parking area, the Burroughs Mountain trail navigates the barren and beautiful terrain of the Burroughs Mountains. Add in the stunning backdrop of Mount Rainier that the Burroughs Mountain trail takes you towards, and this hike will astound you with scenery the entire way. There are many ways to use the Burroughs Mountains Trail, including a 4.5-mile loop that gives hikers a dense taste of the area or an 11.5-mile loop that follows the Glacier Basin Trail for a full day of hiking and breathtaking beauty. The Wonderland Trail is an all-encompassing 93-mile loop that circumnavigates the entire base of Mount Rainier and the gorgeous scenery this alpine environment offers. Featuring big elevation changes plus unbelievable landscapes of luscious meadows, dense forests, and wild water systems, the Wonderland Trail connects and shares footsteps with many of the trails mentioned above and is a popular bucket-list item for backpackers and Pacific Northwest enthusiasts from around the globe. Hikers must obtain a much sought-after permit to trek along the Wonderland Trail and spend the night in the backcountry, and the strenuous endeavor requires an appropriate understanding of hiking skills. Receive the proper permit and backcountry experience, however, plus two or three weeks off work, and you can see for yourself what makes the Wonderland Trail and surrounding Mount Rainier National Park one of the most awe-inspiring attractions in the nation.